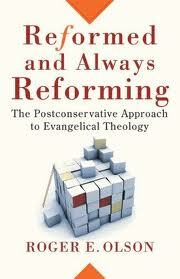 In his book on postconservative theology – Reformed and Always Reforming – Roger Olson makes a valuable distinction between two types of postmodernism. It is a distinction that I came to make in some way in my own mind, but it would have been so very valuable to read it articulated like this back in my undergrad days at Murdoch University in what will turn out to have been the twilight of ‘absolute’ (and ‘hard’) postmodernism. On the one hand is deconstructive thought that seeks to expose the oppressive power of truth claims and especially of metanarratives. Philosophers such as Jacques Derrida, Michael Foucault, and Richard Rorty engage in this hard kind of postmodern philosophy, which seems inevitably relativistic. For them, all truth claims are but masks for will to power. Some critics have described this hard type of postmodern philosophy as “cognitive nihilism.” Its main purpose is to relativize truth. On the other hand is a softer kind of postmodern philosophy found in thinkers such as Alasdair MacIntyre, who does not deny ontological reality or objective truth but seeks to show that even reason always operates within a narrative context. In other words, knowledge may be relative even if truth is not… This is not relativism but recognition of the relativity of perspective inherent in all human thinking. All reasoning and judging takes place from within some local context shaped by a narrative about reality and carried forward within a community of tradition created by that narrative. Conservatives will tend to assume postconservatives are embracing ‘hard’ postmodernism, when in fact they are only using the insights of ‘soft’ postmodernism. Thanks for your thoughtful response Mark. The Housing Bubble and Megachurches: It’s Connected!